No one can make you do anything against your will and you can stop at any time you choose. During Hypnotherapy you will become very relaxed; some people have likened it to a day-dream like state. It is a perfectly safe and natural process. During this time, your conscious mind is quietened. I help your subconscious mind make the changes you want in your life. Anyone wanting to stop smoking, lose weight, suffering from an irrational fear or phobia, scared of making a speech in public, worried about exams, could be helped by Hypnotherapy. We offer a confidential service with a specially recorded CD for clients to keep. Call or e-mail WITH NO OBLIGATION, ''today is the first day of the rest of your life''. 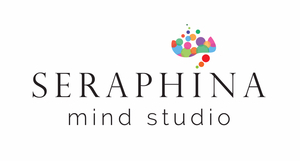 Seraphina Mind Studio can help you to improve your success at school, at work and in your health mental wellness. We offer unique programs designed to change negative thinking and unhelpful behaviour patterns that limit success. We can rapidly help you manage your stress/anxiety, increase your confidence, self-belief, motivation, have greater focus and concentration as well as improve the quality of your relationships, your personal performance and your results. As an accredited Hypnotherapy and NLP Training Centre with specialist clinics we are experts in our field. If you would like to more success in your exam results, career, in parenting or in increasing sales revenues, we can help. I provide a private and confidential hypnotherapy service to help people change their life for the better. I specialise in Drug & Alcohol problems, Sexual problems, Fears and Phobias, Smoking, Weight-loss and Weight Gain, Stress, Anxiety, Worry, Dealing with Bereavement and Divorce. I work out of Portsmouth, but I am willing to travel out of the area. We aim to help people make positive and permanent changes to their lives. Quit Smoking, Stress Management, IBS, Weight Management, Pain Control, Phobias, Fears, Allergies, Panic Attacks, Public Speaking, Body Confidence and Relaxation are just some of the issues we can help you overcome. To see if we can help you please call for a free confidential consultation. We provide our services from The Treatment Rooms, Knowle (Solihull) and The Meridian Centre Billesley, Birmingham. We work with individuals, groups and corporate clients. Darren Marks is an experienced London and Hertfordshire based hypnotherapist and NLP practitioner. He trained hypnotherapists for a private school who operated mainly out of Kings College, London, for more than a decade and is founder of Advanced Hypnotherapy Training Ltd. Darren worked as a hypnotherapist for The South East Cancer Help Centre for many years, where he was invited to demonstrate his hypnotherapy skills for The Prince of Wales during a visit of the Prince to the centre. Hypnotherapy to help people stop smoking, lose weight, confidence, public speaking, phobias, IBS, nail biting, insomnia, stress, depression. I am a qualified Hypnotherapist holding a Master Practioner Diploma in Advanced Clinical Hypnotherapy along with Diplomas in Hypnotherapy and Stress Management and Practical NLP. I am a Member of the General Hypnotherapy Register and I work with clients across Manchester, working from a therapy room in Wilmslow and Central Manchester. I am incredibly passionate about Hypnotherapy and take a genuine interest in each of my clients.